Following the Civil War, Middleborough developed an active horticultural industry with C. D. Kingman, Levi P. Thatcher, Timothy Creedon, Keyes Brothers, and other florists and nurserymen establishing themselves to sell plants and flowers to local residents. Among the plants that these growers raised were dahlias, a flower for which Middleborough would become particularly known in the era between the 1920s and the 1950s. H. C. Monroe is noted in 1897 by the Middleboro Gazette as perhaps the first local dahlia grower of note. " H. C. Monroe is a successful grower of that superb autumn flower, the dahlia and at his garden on Main street he has over 200 plants in cultivation and 100 varieties, some of which are very rare, are embraced in the collection." [Middleboro Gazette, "What the Gazette Was Saying Twenty-Five Years Ago", September 22, 1922, page 7] Monroe's efforts as an amateur grower, however, were eclipsed by those of Francis R. Eaton of Rock Street. Eaton, a leather cutter working for the Alden, Walker & Wilde shoe manufactory, appears to have been the first Middleborough resident to grow dahlias on an extensive scale. By 1909 he was cultivating over 125 varieties, a number of which had been awarded prizes. Eaton propogated the plants on the small plot on which his house stood at 14 Rock Street (the land totaled three eighths of an acre). It became a local landmark, particularly in early autumn when the flowers came into bloom. While these gardeners were likely responsible for popularizing the flower locally, it was not until the 1920s that professional Middleborough horticulturalists took up dahlias on a commercial scale. 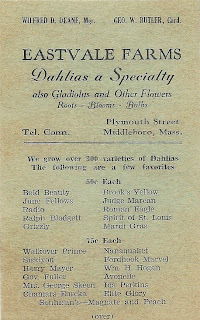 In the 1920s, dahlias became a specialty in Middleborough with a number of growers concentrating on the flower including F. L. Millis & Co. at 96 East Main Street which was advertising cut flowers, dahlias, gladiolus and asters in July, 1922. J. Herbert Alexander was the first Middleborough grower of dahlias of note. Alexander was the son of J. K. Alexander of East Bridgewater who operated an extensive nursery business in that town and billed himself as "The Dahlia King." 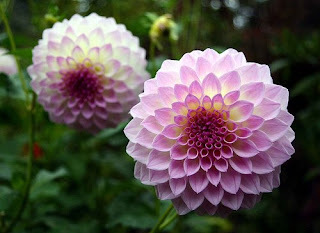 Alexander was a noted specialist in dahlia propagation, and he developed the first American collarette dahlia in 1912. The younger Alexander began operations in 1924 on Summer Street (he was exhibiting at the annual dahlia show at the Horticultural Hall in Boston that fall). The farm later known as Dahliatown occupied nearly 25 and a half acres of land on either side of Summer Street just south of Murdock Street which was later owned by the Dutra family. "Those who visited 'Dahliatown' this summer will be interested to learn that the work of harvesting the six acres of gladioli bulbs is well under way and that in a short time the dahlia crop will be dug", noted the Gazette in October, 1927, hinting at the large scope of the Alexander enterprise. In addition to the namesake dahlias, Alexander specialized in other bulbs including tulips (offering 66 varieties in 1928), crocus (white, yellow, blue, purple and variegated), and hyacinth (pink, blue, white, yellow and red). Also sold were vegetable seeds including those advertised in early 1929: pepper, tomato and early cabbage. "A complete line of strictly fresh VEGETABLE SEEDS" touted the advertising. To help promote his business, Alexander exhibited at agricultural and horticultural fairs and shows throughout Massachusetts and in 1927 his flowers won prizes at the Topsfield, Hingham, Brockton, Barnstable, Springfield and Worcester fairs. Alexander's operation was so successful, that on August 25, 1930, he had leased a portion of the former Eliphalet W. Thomas Farm on Wareham Street near Tispaquin Pond from Thomas's daughter Lurana ("Lulu") Tinkham. "Mr. Alexander is establishing a new branch of his farm on the Cape road in South Middleboro near Carver's Grove," reported the Gazette at the time, slightly misnaming the location as South Middleborough. [Middleboro Gazette, "Record Sale of Gladioli Bulbs", January 23, 1931, p. 2]. In January, 1931, Alexander purchased a portion of the Thomas Farm and in time his entire nursery operation would be consolidated to the Wareham Street location which continued to do business under the Dahliatown name. The location presented a startling sight to those who drove past on their way to the Cape. "Motorists on route 28 are familiar with the great fields of dahlias and gladioli on both sides of the highway during the summer season and the jars of blossoms on sale on the porch" of the sales office building. Assisting Alexander in his work were several employees including Edwin F. Shaw of Plymouth Street who acted as a sales manager for the firm, as well as Mary Allison, stenographer. Unfortunately for Alexander, Dahliatown was a business plagued by fire. On April 20, 1940, a fire destroyed the large farm barn on Wareham Street which Alexander used for the storage of "wooden bulb trays, cardboard shipping containers, bushel boxes and baskets and miscellaneous equipment." Though the fire took place "during the gale-driven rain storm", the winds spread the flames quickly through the wooden structure, and efforts were devoted to saving Alexander's nearby home, a smaller barn, the Dahliatown sales office and a 24-sheet billboard. "A considerable crowd rushed from town to the scene in spite of the cold, driving rain, and automobiles were parked along Wareham street, both sides of the fire." More serious was a fire on the night of February 22, 1943, which destroyed the sales office, stock rooms and work rooms of Dahliatown. The fire started from an overheated stove pipe, which due to the wartime shortage of oil, Alexander had been compelled to install just months prior to the fire. "'Our work of some 20 years of propagation and crossing was wiped out in 20 minutes, more or less,' said Mr. Alexander. 'Everything we had is gone. There was just one order packed and ready for shipment that was not in the burned building.'" The fire seems to have ended Alexander's association with dahlia-growing, and his interest turned to other areas of horticultural pursuit, particularly blueberry cultivation at which he became quite successful. In addition to Alexander, Wilfred D. Deane cultivated dahlias at his farm, located on Plymouth Street at Warrentown. 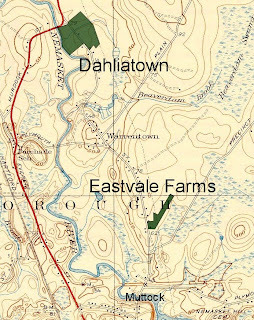 In February, 1928, Deane acquired the former William Quindley property on Plymouth Street near Nemasket Springs through the E. A. Strout Agency, and he immediately began the propogation of dahlias and other flowering bulbs, naming the business Eastvale Farms for its location along the east side of the Nemasket River just north of Muttock. Like Alexander, Deane participated in numerous shows throughout the region in an effort to draw attention to his products, and again like Alexander, Deane was generally successful in winning prizes for his specimens. In 1939, Deane won first place for the best commercial display at the prestigious Dahlia Society of New England exhibition. Two years later, in 1941, Deane won ten prizes at the society's show, including six first places. In 1951, Deane sold the Plymouth Street farm to the Reynolds family and relocated to Wood Street where he continued to operate a dahlia farm under the Eastvale name. In the fall of 1950, Deane featured his first annual visitors' day, inviting residents to enjoy the displays and dahlias in bloom. Shortly afterwards, Deane's operation ended, probably partially due to a decline in the demand for dahlias which were increasingly seen as "old fashioned". Unlike some other flowers, the popularity of dahlias has fluctuated over the years, and they have come in and out of fashion among gardeners. Clint Clark, in his popular Gazette column "By the Way ...", in 1978, wrote a paean to the then long-forgotten dahlia. My mother loved flowers. Her pride an joy was a backyard plot in which dahlias flourished in many forms and marvelous colors. All we can remember of their culture is that we dug holes and pit them in in the spring, dug them up and stored them in the cellar for the winter; and that, without education as to their special needs, they multiplied for us and made a glorious beauty spot. Dahlias were in nearly every garden then, popular, we think, because their vareity of form ranged from compact globes to huge, exotic blossoms. They were perfect for cutting and arranging in boquets. But their popularity, we've noticed, has faded in recent years. Someone said it is because their care is too much of a chore .... So we consulted a gardener who we know grows dahlias, and were told exactly what we hoped to hear - simply dig a hole and cover the bulbs with about 3-4 inches of soil, sprinkle a little fertilizer. We'll get acquainted with bugs and blights later. Today, though no dahlia farms continue to operate in Middleborough, "The Dahlia Farm" name itself remains. Today it is run as a community supported agriculture venture by Jim Reynolds on the former dahlia farm purchased by his parents in 1951 from Wilfred Deane. Appropriately, cut flowers have continued to be grown on the property since that time. 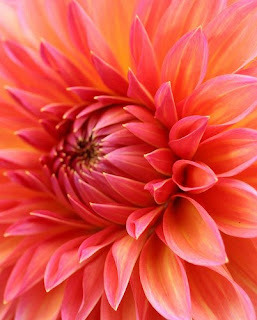 Visit The Dahlia Farm website and blog to learn more. "Decorative Dahlia, Emily D. Renwick, Raised by Mrs. Stout", Mrs. Charles H. Stout, The Amateur's Book of the Dahlia (Garden City, NY: Doubleday, Page & Company, 1922), plate 1. Richard Dean, The Dahlia:Its History and Cultivation (New York: The Macmillan Company, 1903). 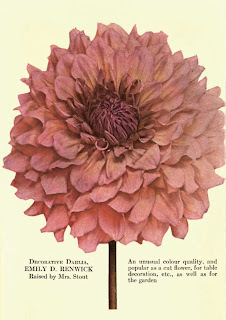 The book was an early standard reference on the dahlia, and was undoubtedly known to Middleborough's earliest growers. "Dahlia close", Steve Plass, photographer, 2008. Republished under a Creative Commons license. Some rights reserved. "World's Largest Dahlia Grower", advertisement. Mrs. Charles H. Stout, The Amateur's Book of the Dahlia (Garden City, NY: Doubleday, Page & Company, 1922), title page.Another book which was successful in popularizing dahlias was this volume, published at the start of the 1920s, a time when professional dahlia propagation in Middleborough was expanding rapidly through the efforts of J. H. Alexander and Wilfred D. Deane. USGS map, "Bridgewater", 1940 ed., with the locations of Dahliatown and Eastvale Farms superimposed. Michael J. Maddigan, 2009. Interestingly, Middleborough's two largest dahlia farms - J. Herbert Alexander's Dahliatown and Wilfred D. Deane's Eastvale Farms were located only a few miles appart on either side of Warrentown. 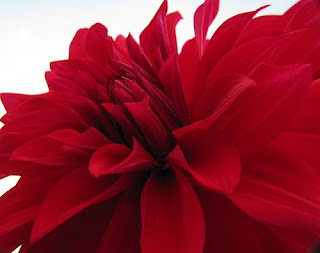 "Dahlia", audrey, photographer. Republished under a Creative Commons license. Some rights reserved. Eastvale Farms advertising card, c. 1940, paper. "Two Dahlias", Steve Plass, photographer, 2007. Republished under a Creative Commons license. Some rights reserved. Clark, Clint. Middleboro Gazette. "By the Way ..." "Dahlias - an oldtime delight", June 8, 1978, page 2. Dean, Richard. 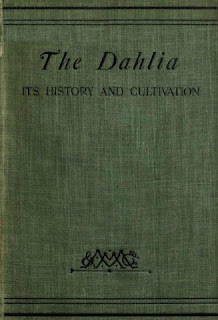 The Dahlia: Its History and Cultivation. New York: The Macmillan Company, 1903. Middleboro Gazette, Eastvale Dahlia farms advertisement, September 4, 1952, page 4. Middleboro Gazette, "Record Sale of Gladioli Bulbs", January 23, 1931, page 2. Peacock, Lawrence K. The Dahlia: A Practical Treatise on Its Habits, Characteristics, Cultivation and History. Atco, NJ: W. P. Peacock, 1896. Plymouth County Registry of Deeds, (Deane) 1549:242, 1549:243, 2143;43, 2583:383, and 3068:112. 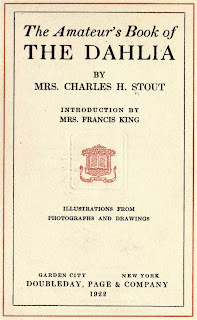 Stout, Mrs. Charles H. The Amateur's Book of the Dahlia. Garden City, NY: Doubleday, Page & Company, 1922.